As for me, I don’t like using the orange-flesh cantaloupe as it may not give a desired taste with most fruits. But if you like that type, you can surely use it with whatever goes with the taste, such as apricots, papaya…etc. 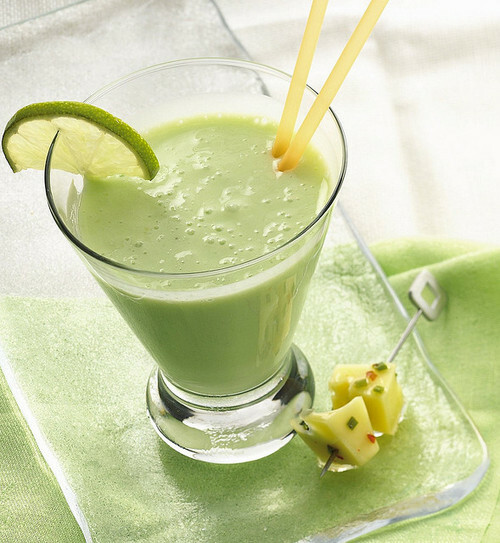 Green cantaloupe give and amazing taste with lemon/lime juice, kiwi fruit, pineapple juice and green apples. I don’t really remember how many else, but those were what I personally tried with dates pieces, vanilla and nuts. It may also give a good taste with berries and bananas. As for which to use, the fruit flesh or juice, apples and kiwis should be used as flesh while pineapples can be used in both forms. Lemons should be processed in the blender then strained before using; and although many wouldn't like to process it unpeeled, I’d recommend using the peels as they have a relaxing and antitoxins effect as well as improving the kidney function in flushing out toxins. In order to avoid the undesired taste of lemon juice generated with peels’ extract, serve the smoothie immediately and don’t let in the fridge. - Add vanilla if you wish to process lemons with milk, and always make sure to not use much milk as it liquefies the mix. - For a very delicious taste use nut milk instead of dairy milk. In this case you will need a smaller amount just for flavor. 1- Use cinnamon or chocolate powder and enjoy a lovely thick drink. 2- Crush a suitable amount of various nuts and sweet biscuits; then stir in the mix and enjoy a nice snack. 3- Add bananas and mix in the blender; that will keep a thicker smoothie. 4- Freeze the mix for 15 minutes and it will stick again even within a shorter time.